In the best tradition of responding to bad with good, “Soccer night in PA for Sandy Hook” took place Tuesday night in West Chester as several hundred people came out to support a good cause by watching a pair of friendlies featuring Bethlehem Steel FC, Reading United, West Chester United, and Newtown Pride, an amateur club from the town where the Sandy Hook Elementary School shooting took place in 2012. Poignant, and perhaps bittersweet for some was the childlike enthusiasm that little kids displayed while playing at halfime while the adults thought of the more than 450 Sandy Hook Elementary children who lived beyond the tragic twenty-odd deaths of that awful morning. A lot of money was raised but in some ways, that is less significant than the intangible acts of remembering and supporting. More mature sides played younger ones and in both cases, the older ones prevailed. 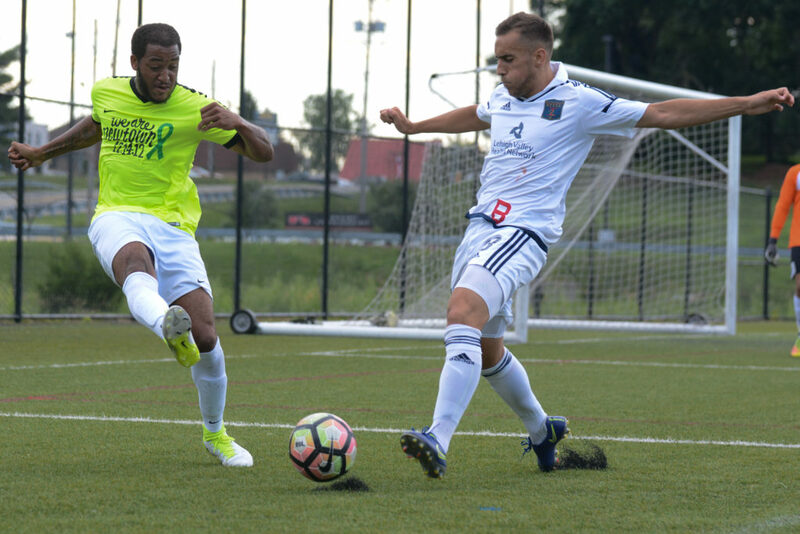 One match was a blowout as postgraduate West Chester United overmatched collegiate Reading United 5-1. And in the other match, the amateurs of Newtown Pride FC beat a squad drawn from the pros of Bethlehem Steel 3-2. In neither case was the result especially important as both games were clean, well-spirited and finished without injuries or booking. Michael Svanda of Newtown (the recently crowned Connecticut league champions) spoke briefly of the tragedy and his side’s secular ministry to it. West Chester United head coach Blaise Santangelo kicked off the event by introducing the local Connecticut agency that will receive the event’s funds. Meanwhile, first responders received warm applause. An ongoing highlight was the Downingtown East band contingent who presented their pep band repertoire as a continuous loop throughout the evening. And a special mention goes to the volunteer solicited over the public-address system who sang the national anthem quite well acapella as a prelude to game one. 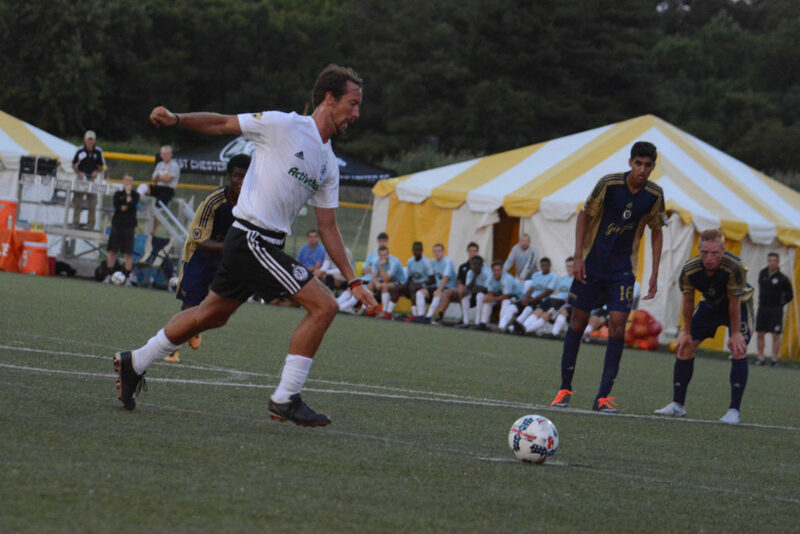 West Chester United took the opportunity to make sure everyone on the squad got solid minutes. The reserve portion of split-squad Reading United came out on the front foot in the second half, playing their opponents even, but could not recover from punishment for repeated first half defensive mistakes. Academy coach Fred ended the game as captain and he almost equalized. Gratitude and full credit to the two sets of match officials who worked the event for free. The first match crew was Michael Syrotiak, Dan Richman, Dan Pannullo, and Stan Nagle, and the second match was Josh Encarnation, Melvin Holmes, Pat Sudol, and Stetson Fenser. Yes, Both Newtown Pride and West Chester United were impressive sides. 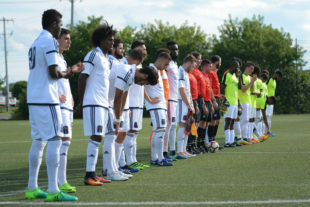 Coach Burke said beforehand that his primary goal, when asked how he was going to play it, was “carefully.” he sent 11 field players – by memory not from notes – and his bench was therefore one of his and three to five academy coaches. Reading had had to reschedule somebody for reasons unknown to me, and so the side that played was reserve with younger supplements. Dan Walsh’s instincts sniffed that down, I can take no credit for it.